THIS IS NOT A ROMANCE NOVEL! I feel I should state that clearly up front because I’ve been writing romance and women’s fiction for so long and that’s where my publishing career started. For the Barbara Meyers romance novel fans, there will be more of those, but this is something so completely different, I decided to write it under a pen name. I had noticed the urban fantasy section of my publisher’s web site was virtually wide open at the time (2008) and once I figured out what urban fantasy entailed I thought, “I can write that.” The Forbidden Bean isn’t quite right for them, however, and positive comments from other editors aside, no other publisher was willing to take a bite, or a sip as it were. 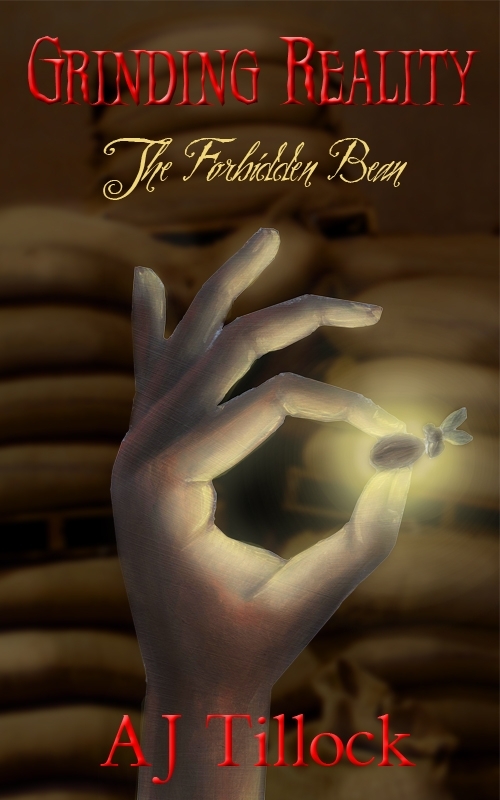 So, here we go again, as part of my grand indepent publishing experiment, with a ninety-nine cent price tag, The Forbidden Bean, the first book in the Grinding Reality series is now available on Amazon.com and will soon be available in iBookstore and on barnesandnoble.com. Love the cover art? That’s the work of an amazing artist, Lindsey Beach. Look for more about the creation of the cover and the book in later posts. But for now…I have to go put my apron on and create a few lattes. Enjoy the power of the bean! Remember, positive reviews help authors AND readers. Authors love readers and want the readers to love their books. addiction, ajtillock, Amazon, barbara meyers. Bookmark.